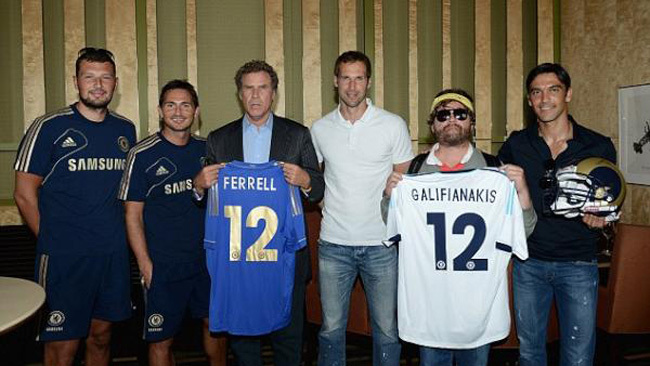 Soon to be co-starring in a movie called The Campaign, heavyweight film stars Will Ferrell (of Anchorman fame) and Zach Galifianakis (from The Hangover) hooked up with some of Chelsea’s squad in Seattle during the Blues’ pre-season tour of the States. Ross Turnbull, Frankie Lamps, Petr Cech and Paulo Ferreira (all pictured) were among the Blues’ players to meet up with the two comedy superstars, giving them Chelsea shirts in exchange for some American football gear. Chelsea fan Ferrell is no stranger to the world of ‘soccer’, having played in the recent Soccer Aid game. However, Paulo Ferreira’s practical experience of the game in recent years is less clear. i was wondering who the bloke on the right was. genuinely thought he’d left them years ago! Possibly the luckiest player to have lived? Why is Paulo Ferreira holding a St. Louis Rams helmet if they are in Seattle? @One England Captain I believe that award goes to Gerad Pique. The only trophy hasn’t won is the F.A. Cup I believe. However Shakira more than makes up for that. Holy smokes!, Ross Turnbull is a beast!